The December evening was cold. As Hans Schlaffer left the Anabaptist meeting in Schwaz, he was headed up the Inn River toward his home in the mountains of Austria. There he planned to sit out the winter months until Spring, when he would renew his ministry. But the plans of this former Roman Catholic priest received a rude shock. On this day, December 5, 1527, Hans Schlaffer was arrested by local Roman Catholic authorities. 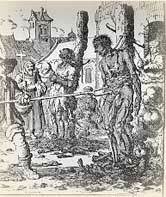 In nearby Frundsberg Castle, they tortured him and priests examined him about infant-baptism. Hans said that according to scripture, a man had to "hear, understand, believe, and receive" God's word before being baptized. As he saw it, this alone counted as Christian baptism. Children need not be baptized and the Lord did not command it because they were already his. He might have added, as he had written--and was now demonstrating-- that "the Christian life is not child's play; but bitter earnestness, truth, courage and saintliness must be there." When asked on what foundation the Anabaptists rested, he replied, "Our faith, actions, and baptism rest on nothing else than the commandment of Christ." "Oh Father in heaven, whoever lives in Christ your Son and suffers and dies with him will rise with him in glory to be in his Kingdom forever. This is how we have understood the holy Gospel. This is how we understand Christ and his teachings, and this is how we now understand the word faith which we never understood like this before." "Eternal Father! We pray that You will send workers into Your vineyard; for the harvest is great, while the laborers are few. We pray for all those who carry Your gospel throughout the whole world, that You will strengthen them with the power of Your holy spirit, that in them all the terror of man may be quenched and that they will not renounce Your Word through fear. "Sustain us in Your Holy Name, and let us not wander away from You, fountain of living waters, that we may hold fast to the true faith firm unto the end." Eyre, Alan. "Brethren in Christ." Williams, George Huntston. The Radical Reformation. Philadelphia" Westminster Press, 1962; p. 173.